If you are coming for summer in Bora Bora, be prepared for heat, humidity, rain, and hot sun! This is the tropics, and summertime in Bora Bora is the rainy season. Summer in Bora Bora begins at the end of November and goes through to March. These months are hotter, wetter, and more humid, than winter in Bora Bora. The summer temperature in Bora Bora averages from 86-88ºF (30-31ºC). The weather in Bora Bora in summer is unpredictable. A single day can have both rain and beautiful sunshine. More rain falls over these months than at any other time of year, making the tropical vegetation vibrant and lush. Rain can set in for a few days at a time, lowering the air temperature. Storms passing in the Pacific may cause a butterfly effect leading to windy weather and choppy seas. We've also experienced that summer in Bora Bora can be sunny, hot and calm; just perfect for enjoying the water activities. But because, during summer in Bora Bora, weather is uncertain, less tourists visit at this time of year. The lagoon temperature is warmest over the months of November, December, January, February, March and April. 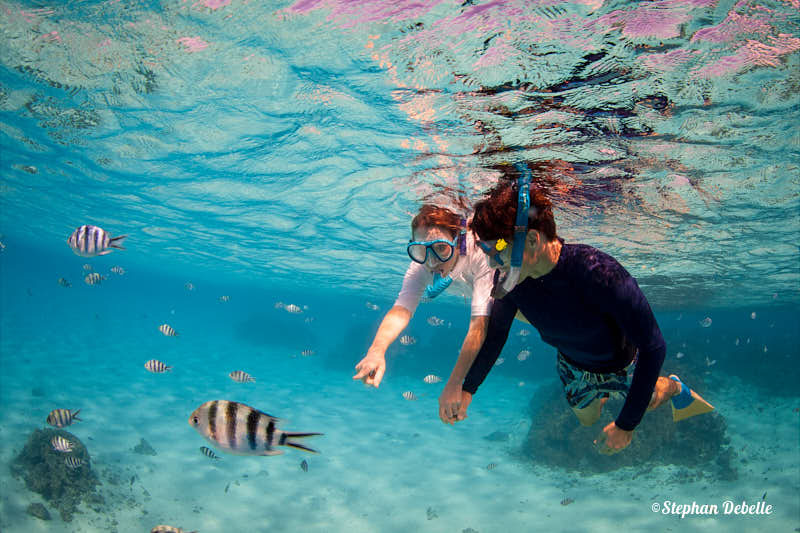 The warmer sea temperature makes this a great time of year for all the water activities in Bora Bora. We enjoy the lagoon most over the summer months in Bora Bora. Be sure to bring sun protection, including rash vests and board shorts, if you are going to spend hours in and on the lagoon: the sun has a bite to it at this time of year! What to bring for summer in Bora Bora? Can you believe that locals sometimes refer to summer in Bora Bora as the cold season? This is because when the rain sets in for several consecutive days; the temperature drops. And while this may be a mild temperature to some of you, we have seen the locals wearing cardigans and sweaters, and we were wishing we had brought some! However, when the sun comes back out, the humidity soars, and it is hot again. If you are traveling to Bora Bora over the summer months, make sure you bring a comfortable rain jacket; preferably one that is wind-proof too. Or, like us on our first Bora Bora summer vacation, you may find yourself - or lose yourself - in the plastic poncho handed out at most resorts at this time of year; which resembles a plastic bag! The summer rainy Bora Bora weather means more mosquitoes are around. The luxury resorts spray for mosquitoes; but if you are staying on the main island, at the Pearl Beach, or at the Conrad resort - which are on larger motus with more insects around - you will want to have mosquito repellent on hand. If possible, have an overwater bungalow stay during summer as the mosquitoes don't like salt water so you can leave doors open. 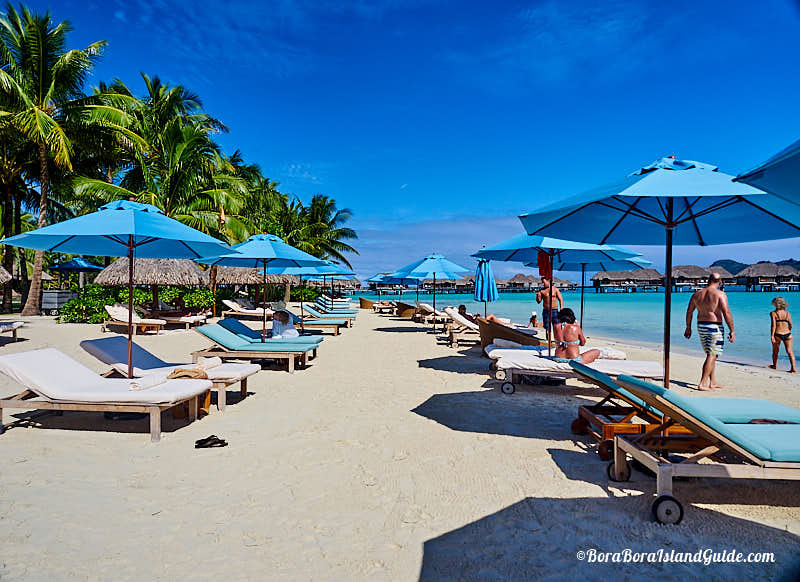 Summer time in Bora Bora is the low season for traveling; with one exception, the period from Christmas to New Year, which is classified as peak season, because holiday-makers escape from cold climates. We've had a white sand Christmas in Bora Bora and it was beautiful. Summer is a great time for those on a very tight budget to travel to Bora Bora . Planning your trip for the summer months means flights and accommodation will cost much less. So decide if you can have an enjoyable time whatever the weather each summer day turns on. Bora Bora is beautiful in the rain too; if you come prepared. At the beginning of November, the Hawaiki Nui canoe race attracts over a hundred racers from French Polynesia, Hawaii and Europe who compete over three days. It's a sensational event, as canoing is the most popular Polynesian sport. The race has several legs: venturing through the islands of Huahine, Raiatea, Taha'a, and Bora Bora; coming to an exciting finish right on famous Matira Beach. Described as part race, part torture test and part tropical vacation, the Bora Bora liquid festival is a challenging competition that includes prone paddling, swimming, and SUP. There's a lively celebration on Matira Beach at the end of the event. Still deciding whether to vacation during summer in Bora Bora?